Weddings are a passage of the joining and bonding of two separate lives becoming one. As a result, the closest of friends, family, and pets share in the celebration. Yes, I said pets. Certainly, your furry companions have been there through thick and thin. For some families, they have been there from the start of the relationship. Therefore, if they are a part of your family, they should be a part of your wedding! 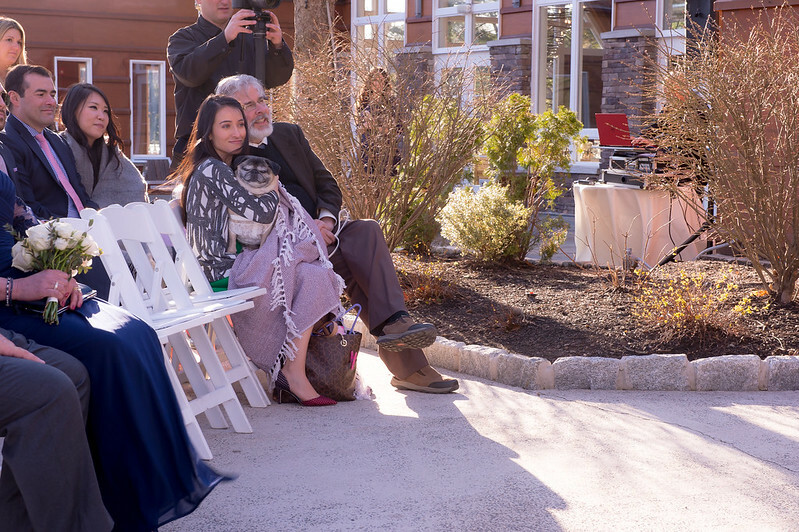 Canine Concierge was extremely honored and excited to help make clients Maria and Bill’s wedding day everything they’d dreamed of. 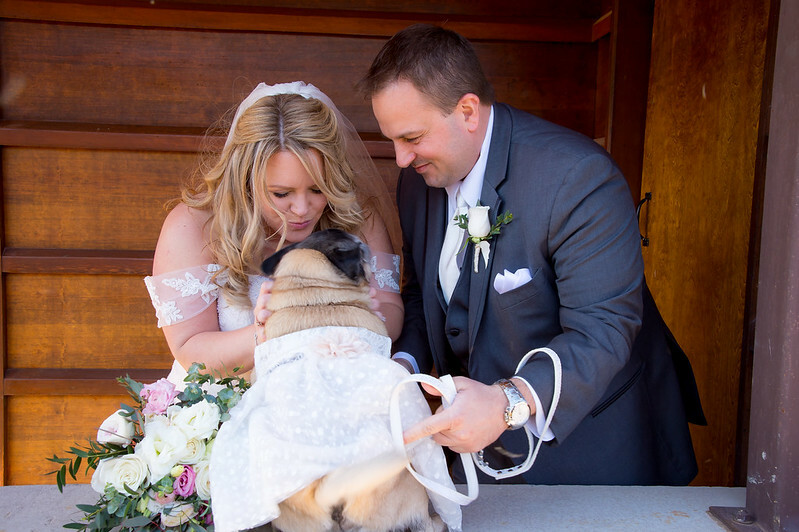 They’d envisioned their special day with their little pug, Sofie, front and center when they shared their vows and exchanged promises of a forever together. Months before the official wedding date, the happy couple met with founder and owner Lauren Molina. At this complimentary meeting, they discussed the preferences and expectations of their big day. Customized to their specific needs, an itinerary was created. As a result, the wedding attendants, or as we like to call ourselves, PDAs (Personal Dog Attendants), have clearly laid plans to follow on the wedding day. This is to ensure a smooth and happy ceremony. Finally, their special day arrived! The location was a rustic, romantic outdoor venue in Warren, NJ. The crisp, sunny day would mark the start of their forever day. All of their loved ones were present to rejoice in their union. Most noteworthy, a gleeful Sofie was sitting in the front row staring at her mom in complete admiration. Maria would look stunning in her strapless mermaid-style wedding gown. 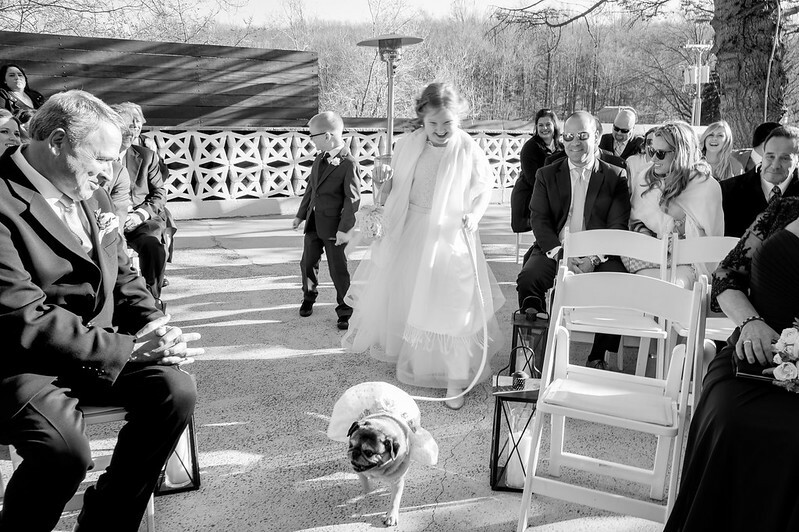 But Sofie, her sassy 10-year-old pug, would steal the hearts of guests and attendants alike in her matching A-line dress and sweet smile. First, Sofie’s day started off with her usual walk around the block with her go-to walker (now upgraded to PDA). Then, that was followed by some one-on-one attention and lots of water and some treats. Shortly after, her second PDA for the day showed up who then made sure all of her belongings were accounted for. They both assisted loading a crated Sofie into her car. If they could review Sofie on Yelp, she would receive 5-stars as a road trip companion. She sat so well on the transport to the venue and that made for a smooth trip. Once at the venue, Sofie and her belongings were escorted inside by her PDAs. Next, they walked the premises and then greeted the bride and groom with excitement. After some hellos and pug wiggles, they departed and Sofie enjoyed some fresh air on the outside patio overlooking the gardens as the sun shined down her back. After many pets, rubs, and compliments on her pretty dress, the PDAs gave her another walk around. Afterward, she joined her mom and dad in their “first look photos.” The PDAs stayed close by to assist where they were needed to help ensure that perfect shot of the happy trio. The ceremony started shortly after the photos. All the guests were seated. Sofie was handed off to the flower girl who would walk her down the aisle. One by one the bridal party began making their way down the aisle. Sofie had an enormous smile plastered on her face as she led the way past family and friends. She sat comfortably on her PDA’s lap as her mom walked down the aisle to the song “A Thousand Years” playing softly in the background. Sofie could not take her eyes off of her mom, who would turn every so often and flash her little girl a smile. All eyes on the girls! Sofie was represented everywhere in the wedding. She even had her own Dog Vow read before the “I dos.” The happy couple exchanged rings and a kiss and led the way to cocktail hour where the party would get started! Sofie and her PDAs spent their time in the lounge just outside the party room. Sofie was fed cheese and shrimp, her absolute favorites! With one more walk around the grounds and a plethora of goodbyes, the PDAs gathered Sofie and her belongings. Finally, they headed home before the reception would commence. Back home, Sofie was on a high of such a magical day and the fun would only continue. The PDAs cleaned up, made sure all belongings were back in place and the sleepover would officially start for Sofie and her favorite walker that evening. 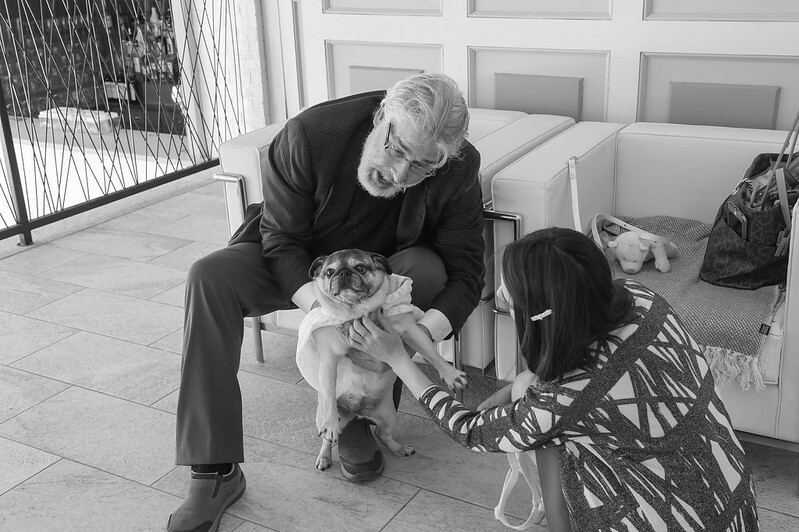 Canine Concierge would love to thank Maria and Bill for allowing us to be present and help make their day extra special with Sofie by their side. From all of us here, we wish you a thousand years of happiness and many of days filled with greater and greater memories. Looking to make your wedding extra special? Check out our Services page for information on how we can help!